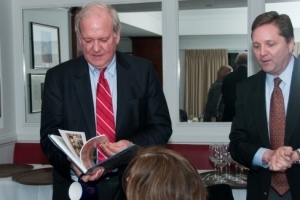 Former White House Press Secretary Mike McCurry (left) leafs through the book presented to him to by Tom McMahon, chair of the National Press Club Communications and Marketing Committee, following his April 10, 2014, dinner talk to the committee. Former Clinton Press Secretary Mike McCurry delivered a candid talk at a National Press Club Communications and Marketing Committee dinner April 10 and predicted Hillary Clinton may not run for president in 2016. McCurry waxed eloquent on aligning faith and politics in today’s Washington and the lack of civility in our discourse. Veteran communicators asked questions that cut across McCurry’s storied career in Washington. Members seemed most intrigued by McCurry’s work at the White House and how he handled crisis, international press and transitioning to the private sector. But one guest, Janessa Agnew, a student at American University and volunteer at the Democratic National Committee, asked how one might become involved in political communications. “I volunteered for [former and current Gov.] Jerry Brown because I was from California," he added. As White House press secretary, “one has to have a broad set of interests. Foreign policy to personal stuff” about the president and his family. McCurry had worked at [Department of] State prior to joining the White House. He then made his 2016 prediction about Secretary Clinton deciding not to run for president. McCurry’s own narrative is fairly well known. He worked for former Sen. Daniel P. Moynihan, D-N.Y., in his early Washington days. He is now with Public Strategies. He reminded the Press Club veteran public affairs folks of his resume by listing some well-known events. “I was at State in 1993-94 during Somalia and Black Hawk down. In 1995, it was the Gingrich era and that inexorable dance. In 1996, we had the reelection campaign. In 1997, was l’affaire Monique,” McCurry said. The Communications and Marketing committee, which is chaired by Tom McMahon, hosted the dinner in the Winner’s Room of the NPC's Fourth Estate restaurant. Danny Selnick of BusinessWire helped arrange the McCurry discussion.